When it comes to needing to have repairs done on the foundation of your home, it is imperative that you hire a reputable professional company that is highly qualified. Below are helpful suggestions of what to look for and what to avoid when hiring foundation contractors. Great Recommendations – the best place to start is by asking your relatives and friends who they would recommend. If they were happy with the results a company offered, this is a name to put on your list of contractors to contact. Use Online Reviews – Online reviews such as Angie’s List, Kudzu, Google+, and Yelp will often provide helpful reviews. If the company that you are interested in is not on one of these Online review sources, do not fret. That just means you will have to do a little more research on your own. Are They Licensed and Insured? – One of the very first questions you need to ask when you begin calling around is if a company is licensed and insured. If they are, continue with your research; if they are not, continue your research elsewhere. Get Multiple Estimates – It is always a good idea to get 2nd and 3rd opinions before committing to a single contractor. Remember, your home is not an expense, it is an investment, and you typically get what you pay for. Therefore, keep in mind that cheaper is not always better. Pressure Sales & Scare Tactics – Foundation issues are no small matter, and they need to be addressed sooner rather than later. However, if a company is pressuring you to sign the dotted line or to make full payments upfront, run away! Requiring You to Apply for Permits – A foundation company is responsible for the work that they provide, which means that they should handle the application process for permits on your behalf. 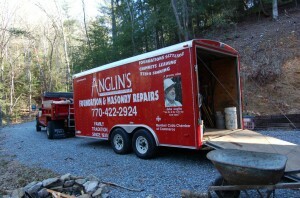 A reputable repair team should make your job as easy as possible.